What would it mean for your organization to embrace and adopt an account based marketing approach? How would it impact the relationship between your sales and marketing teams? On this episode of #SellingWithSocial, you’ll hear from account based marketing expert, Sangram Vajre. Sangram is the Co-Founder & CMO of Terminus. He has quickly built a reputation as one of the leading minds in B2B marketing. Before co-founding Terminus, a SaaS platform for account-based marketing, Sangram led the marketing team at Pardot through its acquisition by ExactTarget and then Salesforce. In 2018, Sangram was named one of the top B2B influencers to watch by B2B News Network. Sangram is the author of “Account-Based Marketing For Dummies” and is the mastermind behind #FlipMyFunnel. Don’t miss this exciting opportunity to learn the ins and outs of account based marketing from Sangram on this episode! Why account based marketing is good for sales. How can an account based marketing strategy lead to more sales? On this episode of #SellingWithSocial, Sangram talks about that moment when he realized what the shift to account based marketing would mean for both sales and marketing teams. Sangram stresses the benefit of this approach in the fact that marketers are finally speaking the same language as salespeople which is account based. With both teams on the same page, image how much increased productivity and potential that means for your workforce. Make sure to listen to this episode as Sangram elaborates further on account based marketing and how leaders like you can get the most out of this innovative strategy! Should marketing be held to the same standards as the sales team? Is it fair to have one segment of your organization held accountable when numbers and quotas aren’t met? What would it look like for the rest of your business, including marketing to be held to the same standards that your sales team is held to? On this episode of #SellingWithSocial, Sangram and I discuss what this shift in organizational culture would look like and why we think it would lead to increased success. If all members of the company are held to the same standards, then everyone wins as a team and fails as a team. Wouldn’t you love to see your sales and marketing teams meeting together and working in unison? Wouldn’t it be great to see finger pointing and blaming cease? That’s the result of embracing and adopting an account based marketing strategy. Don’t miss additional insights and lessons from Sangram’s unique perspective on this episode! Are leads still needed with the account based marketing approach? Can you imagine a world where leads are no longer needed? That sounds crazy, doesn’t it? When it comes to account based marketing, the volume of and focus on traditional lead generation shifts. On this episode of #SellingWithSocial, Sangram explains why a heavy focus on traditional lead generation is no longer needed with account based marketing. Did you know that a 2015 study conducted by Forrester found the traditional lead generation and engagement approach yields less than 1% success rate? It’s time we embraced a methodology that doesn’t waste 99% of our time, money, energy and resources on things that don’t drive revenue! According to Sangram, it you begin to adopt account based marketing, you can then tier your your non ABM accounts and allocate time and resources according to their level of value to your organization. 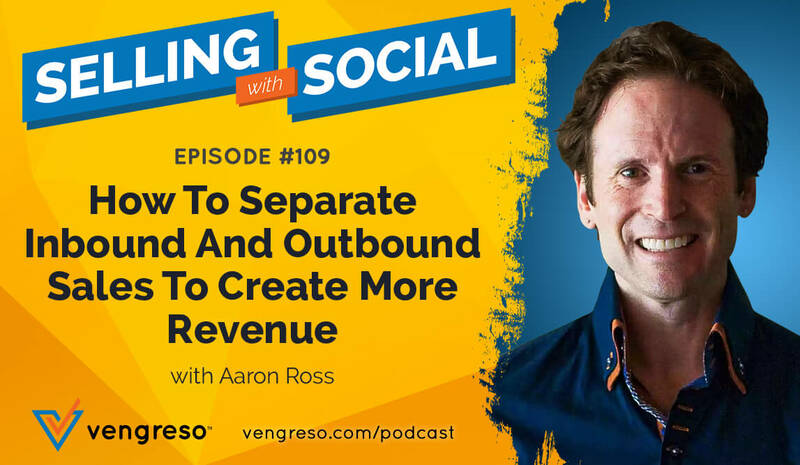 Learn more about ABM and it’s many benefits on this episode! Account based marketing tactics that will put your business ahead. What account based marketing tactics can help your organization not only stay competitive but push forward to the next level of growth? On this episode of #SellingWithSocial, Sangram shares several tactics that leaders like you can leverage as you embrace account based marketing. One of the major advantages to account based marketing is the ability to narrow your focus and deliver quality over quantity. Instead of spending your resources on thousands of leads, you can craft and customize your messaging and advertising in a personalized way that will connect with your customers and prospects. Discover additional tactics and insights that account based marketing provides on this episode featuring Sangram! [1:00] I introduce my guest, Sangram Vajre. [3:00] Sangram shares the backstory of Flip My Funnel. [5:00] Why is Account Based Marketing (ABM) good for sales? [8:00] Addressing the disconnect between sales and marketing. [10:30] Should marketing be held as accountable as sales for missed quotas? [13:30] What does it take to target the right customers? [17:00] Tactics of Account Based Marketing. [23:00] How to leverage Account Based Marketing tactics. [25:00] Measurements of success and what to expect. [31:00] How do the responsibilities of the executive team factor into the ABM system? [34:00] Leads are no longer needed in the ABS system. [37:00] What does the “Hallelujah” look like ten years from now for sales and marketing?